I am one of those who starts dragging out the christmas items, the minute my guests leave on Thanksgiving. This year we have the new kitty Dora and my sons cat who seems to have decided she lives in the cellar. Every year I find new cat collectible ornaments and my tree is covered in cats, even the tree topper. Well, with Dora, I decided it was not a good idea to put my collectibles up with her and the hard wood floors. I thought a cheapy walmart tree would be easier and smaller to fit in the space. Now of course I wish I had gone with an alpine tree, but for this year it will do. I added a couple of my ornies and some old ones I made years ago, along with ones from swaps and friends. I put my vine wreath on the wall for now, but I would like to find or make a skinny ladder to go there. It is still a work in progress. I still need to make some vintage ornies from print outs I found on the web. 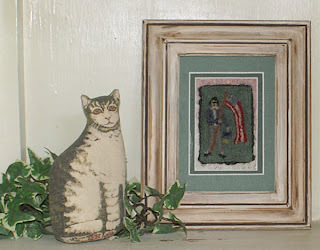 The decor is based on cat proof prim, hehe. 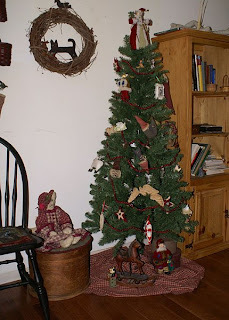 If you notice the rocking horse under the tree, that was a repro I bought years ago. The sun has faded the colors and the cats ate off most of the tail, so it looks like a real antique now, lol. The kitty doll is one I made. Someday I will get back into making dolls again. 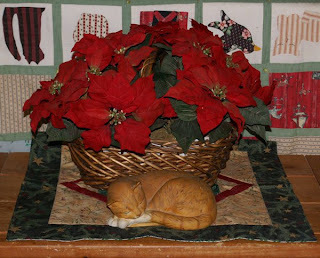 Here is a simple setting I did with poinsettias and an old cat, I just can't seem to get rid of. The beautiful quilt topper was made for me in a quilt swap. This is one of my favorite finds. I found it in a plastic bag in a salvation army. 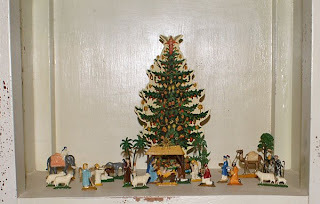 It is an old childrens nativity and the tree was with them, so I always put them together. I still need to put up my nativity sets. One my son bought me and I have added to it and the other is a plastic set that we bought after we got married. Today I wanted to go out and shop and not get mobbed by the crowds or have to deal with the traffic. I looked online and found a place in Foster, RI called Things Made Wonderful. I was in heaven, lol. The entire first floor is set up with different rooms filled with primitive goods and the upstairs is filled with booths that have antiques and hand made goods. I found a new shelf for my wall collection, perfect to put up some ornaments from my collection. The box came with some grubby candles and I used those on the other shelf. I also dug up a few other things to start my christmas decorations. 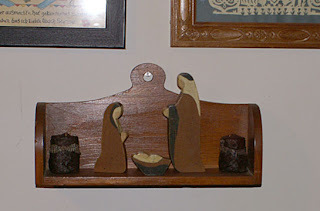 My husband cut this nativity out for me and I painted it, that was years ago, but it would be fun to make up some more as gifts. I love the simplicity of the set. I think my old shelf needs a new prim coat of painting and antiquing. I love consignment shops. Our's have a lot of antiques and prim items in them and you never know what you will find. I saw this rack and decided it would be a nice small item to decorate with. It came with the peg rack, so I can also hang ornies on that. I just threw some things on it for now and put it in that space, since it is item at the moment. 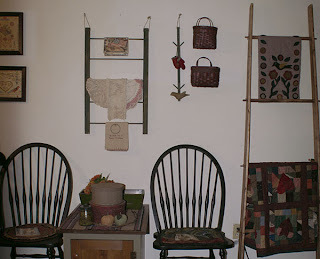 I was planning on putting a wall quilt there, but now I am thinking of a long shaker peg rack and then building a hanging shelf and candle holders to go on it. My husband is getting better at building me things as he learns, lol. He used to make me shelfs, benches and other wood items, but he has gotten out of practice. We will have wainscoting on the walls half way up, so I like the idea of prim shaker to keep it simple. The doilies I hung on the rack are ones I made years ago. I think I need to stain the white one to match the aged look of the others. Who would have thought my lace doilies would make great antique decorations now that they are old;) I just used what was lying around and easy to find. I will be decorating for christmas next week, so will wait till I dig out the boxes, then I can redo the room. For today through sunday night, I will offer 2 (Two) of my ebooklets for the price of one. Just go to my ecrater (Woolensails) store and decide on which two booklets you would like and then email me with your request. You can either email me with a paypal payment and put down which two booklets you would like or you can email with the booklet requests and I can send you a paypal receipt. I will be doing new patterns for next year, but for now I am busy working on presents and things for my house. I may try and get some single patterns up in the next few weeks. I will announce it here when I do. Thanks to all who have bought booklets from me and I hope you will all share pictures of your finished pieces with me. I have been busy working on gifts for swaps and friends this month. Since I have been fighting off a cold, I don't have a lot of energy and work on projects that I can do in my lap. Today I got some of the machine sewing done and will try and finish off more tomorrow. I got a surprise in the mail today. A group I belong to, is doing a Christmas swap and I got mine early. Of course I am not going to wait till Christmas to open it, I can't wait till I get in the door to rip it open, lol. 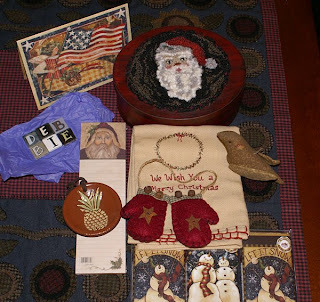 I got lots of wonderful goodies, an antiqued box with a punched santa and the beard is done in a thicker wool, what a nice effect. Some new ornies to hang on my prim tree, (When I find one or make one) and as you can see lots of other nice things. I love doing swaps with fellow prim lovers, they always know what we love. The little tiles that spell out my name are magnets, perfect for my kitchen. I guess I better get moving and finish my items so I can get them out in time. Today was another nice day and I couldn't resist going for another walk. I love walking, it always makes me feel great and rejuvenated. It won't be long before the winter chill will turn me into a hermit. We went to the bird sanctuary since it was a little brisk. It is more sheltered and a good walk if you do the both pathways. There were lots of ducks and swans out today. In the little cove a Comerant was sitting by himself. 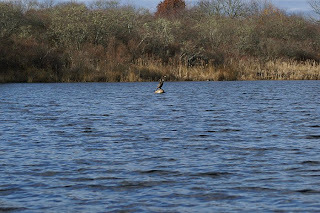 I had my Zoom on, to get some close ups and of course, just as I was walking back up the path, the swans decided to take off. It is so beautiful to watch them as they fly across the water. They stay at the water's surface and flap their wings to get to another area faster. 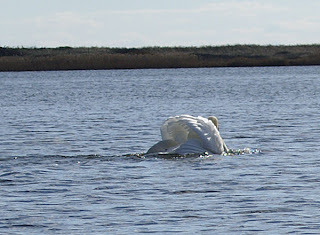 Their wings are so powerful, you can hear them as they beat up and down and splashing their legs across the water. So, I had to be satisfied with a shot of one of them after they slowed down. Tonight I was working on the computer and turned around and got the funniest look from Casey and Dora. 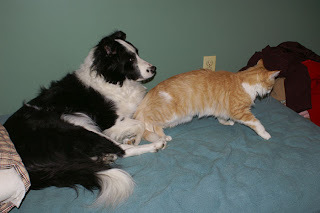 Dora was lying on the mattress and Casey decided he wanted to be on it too. Well they both gave me that look as if to say, will you tell her/him to get off. And of course as I grab the camera, Dora decides to give up and leave. 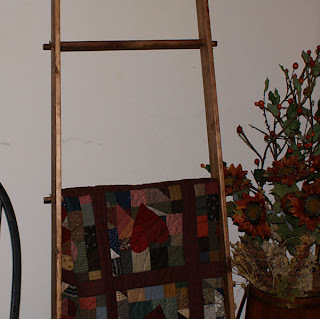 I have been wanting a quilt ladder to display the quilts I am making and I finally got my husband to make me one this weekend. Their was supposed to be 5 rungs, but I guess my husband didn't hear that, lol. I do make larger heavier quilts, so this will be great for that. Later, I can have him build me a skinnier one with more rungs. Today was another beautiful day, so I had to take advantage of it and go for another walk. We headed for Wakefield, an old town in the southern region and hit one of my favorite antique consignments. Unfortunately, I didn't find any goodies today. 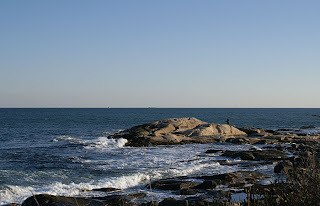 We decided to go to black point, it is a beautiful walk along the rocky shores that takes you along a path overlooking the rocks and to Scarborough beach. You can walk along the rocks too, but I stayed on the path and walked on the rocks near the biggest rock, where most people love to climb around and explore the tidal pools. 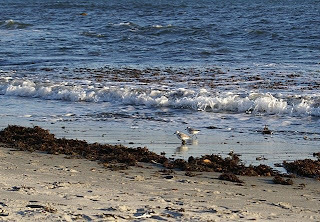 At the beach, the sand pipers were running back and forth with the tide. The minute the tide goes out, they run towards the water, grabbing food and then running back as the next wave comes in. They are never standing still for more than a few seconds. This is a view of where we came down to the beach. There are crumbled structures still standing where the people who once lived in the area had homes and docks on the shore. Most of the area was farm land, so I can only imagine what it had been like a hundred years ago. As you can see in the sky, the moon payed a visit, early today. We have had a beautiful Fall this year. The temperatures are staying warm and except for the rain this week, the sun is shining. 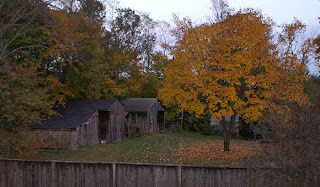 I love being able to go out for walks in the fall, it is so much cooler and no crowds. This week I have had the flu, so spent a lot of time resting and working on my christmas projects. I thought you would like to see one of my views from my porch. This is my neighbors yard. Their house is one of the oldest on the street, it was a farm before the land got sold off. I am lucky because they gave their relatives a lot of the surrounding land, so there are fields and woods around me. This picture is just at sunset. The sun sets off the colors of the leaves with a golden hue, a magical time of day. Today I felt better and wanted to get out, even though it was cloudy and possible rain. We went to one of our favorite spots, the salt pond with the ocean just over the banks. 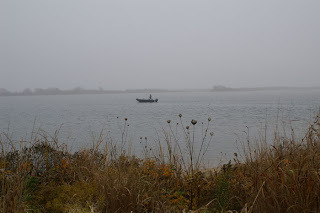 It was really foggy out and a bit of drizzle, but it felt great to get out and breath in the salt air. This week I have been fighting off another flu. I think I am a flu magnet, and since I am allergic to the shots, I have to put up with them. I have been busy making new items for christmas, so of course I cannot show you them, since they are presents and surprises. Last week I made a prim candle mat for a fellow prim lover's birthday. 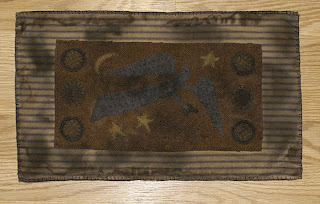 I really love making gifts for my friends.This penny rug was inspired by a gravestone design. I really love how it came out, really dark and prim. I plan on spending my time this season working on gifts and creating new ideas, so I will be getting back into patterns after the holidays. I have found out that Dora is a bully. She loves tormenting my sons cat, and they spend their time chasing each other up and down the stairs. Hopefully Dora will get over her jealousy and let the kitty upstairs.